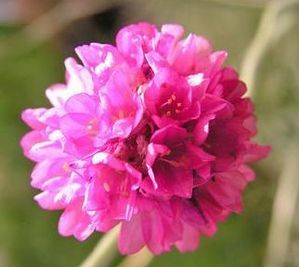 It makes nice little tufts of grass-like variegated foliage growing 4-6” with pink globe like flowers in late spring. 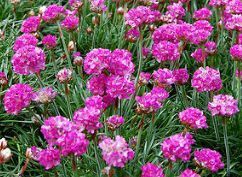 Trim off faded flowers to encourage repeat blooming. 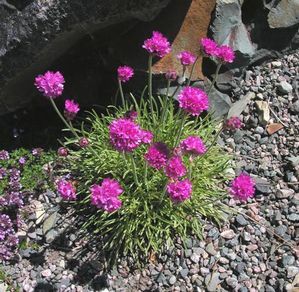 It does well in container or rock garden or as an edging plant. Prefers average to dry soil. Watering twice, a few minutes apart, helps water soak in deep. Never overwater, or you may cause root problems. Mulches help reduce water evaporation in hot or dry weather. When possible, water in the morning to avoid promoting diseases from night watering. Remove dead, faded, or diseased foliage as needed. Remove some foliage during transplanting to reduce stress on new roots.